I finished my last blog by saying that I was to start work as a trainee towel weaver at the Beehive Mill, Lostock, Bolton. Well, nothing anyone said could have prepared me for the shock to the system of actually walking into the weaving shed on that first day when it seemed as if all the demons of hell had been released. The sheer speed and clatter of the looms was frightening to a young and inexperienced girl of barely fifteen and I felt totally overwhelmed. It could be a dangerous place too, such as when the belts that descended from the central drive shaft broke, snaking like a whip round unwary weavers’ legs. Then there were the 12-inch steel tipped shuttles that occasionally flew out, causing considerable damage to either looms or any weaver who happened to be in the way. On my first day as a towel weaver, I, along with two other trainees, was assigned to an older weaver. With no chance of a normal conversation, she had to shout instructions directly into our ears. Most of the weavers communicated with a combination of lip-reading and exaggerated hand movements known as ‘mee-mawing.’ Our instructor taught us how to stop and start a loom and to replace a shuttle. Re-threading an empty shuttle was a fiddly process that needed precision and took some time to master. Many of the older weavers still drew the thread through by sucking, known as ‘kissing the shuttle,’ but this was frowned on as the cotton fluff could clog the lungs. We started at 7.30 am and finished at 5.30 pm, making it a 45-hour week. The mill itself was a Victorian structure with an assortment of buildings clustered around a mill yard and a gatekeeper’s lodge which might once have been the mill manager’s house. After punching my clocking-in card into the machine, I’d make my way through the bleaching and dyeing rooms, holding my breath against the stench. Next came the sweeter-smelling warp shed, containing the stacked drums of spun cotton waiting to be lifted onto the looms. The adjoining weaving shed, with its ridged glass roof, was either uncomfortably hot in summer or piercingly cold in winter. All would be silent to begin with. Then, as the central drive shaft hummed into life and the pulleys started turning, a solitary loom would clatter into life to the cat-calls of ‘grabber’, followed by another loom then another until the noise reached its usual crescendo. I’d set my own looms going, one by one, then I’d be replacing shuttles, threading them, resting them against the wooden barrier that protected me from the spiked roller that held the already woven towels. I had to be on a constant watch for broken threads which needed to be ‘drawn-in’ with a reed hook. Failure to do so could result in a ‘smash where the loose end became tangled with others, breaking even more, and risking the wrath of the ‘tackler’ (mechanic) who would have to sort it. Spoiled towels didn’t count and, as we were paid on piece work, this was important. Our first break would be ‘brew time’. A huge cistern was located in the warp shed and weavers would stand in line, glad of a chance to chat, each with their own mug with a teaspoon of tea and sugar in a twist of greaseproof paper. The cistern was temperamental and known to spit if you weren’t careful. At dinnertime, when the ‘hooter’ went, the looms would fall silent as the central drive shaft and pulleys slowed then stopped. In chattering groups, we would make our way across the mill yard to the canteen where we would eat our dinners, serenaded by ‘Workers’ Playtime’ on the wireless. Although earning a good wage was the primary objective, fun and laughter were important too. When one of the weavers was getting married, her looms would be decorated, not only with useful household gadgets but often with suggestive items as well. When it was time to go home, her coat would be decorated with balloons and ‘L’ plates and she’d be carrying a suggestively illustrated chamber pot. A couple of her colleagues would accompany her on the bus, to her embarrassment and the amusement of fellow passengers. Christmas was a time of merriment, too, with looms decorated with tinsel and balloons. The more daring weavers had a sprig of mistletoe tied to one of the cross beams so that they could catch the ‘tacklers’ and warp carriers unawares. Going home, the weavers would be slightly merry after the ‘footing’ of sherry and mince pies. 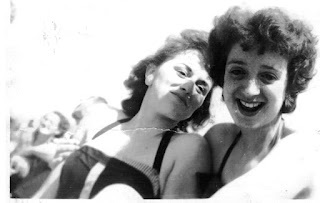 My friend, Vera, and I - still friends 60 years later! Morecambe and St Anne’s had their share of visitors. The mill towns became ghost towns while local train stations were packed as people waited to get on excursion trains. On fine days, the beach at Blackpool would be so crowded, there would be scarcely room to erect a hired deckchair let alone spread a towel. And, if the weather was wet, there was always the Tower with its zoo, aquarium, circus and afternoon tea in the ballroom, with Reg Dixon playing the organ. The Pleasure Beach, with its many sideshows, rides and bruise-inducing Fun House was a magnet for young people. On a night, either the Tower or Winter Gardens ballrooms were the places to be. Much of this is included in my novel Bittersweet Flight. Although there was good money to be made in the mill, I never made a fortune because I didn’t apply myself diligently enough. Too much day-dreaming, possibly! I finally left after six years to work in the Advertising Accounts Department of the Bolton Evening News, the local daily newspaper. Although at the time, I thought I hated my time in the mill, I can look back now with nostalgia, proud to have been a part of the once great cotton industry of Lancashire.